I was interested when I saw the press-release about the "FitBit™ Ace" that was so unabashedly paternalistic. Like, in a "Fathers Know Best" kind of way. […] it’s designed to get kids active while helping parents keep an eye on how much activity their child is getting. […] an activity tracker is a great way to gamify activity for kids and help parents monitor how much time their child spends moving around versus sitting around. Here's another great idea: the FitBit™ Chattel Monitoring Collar. Not just for children: use it for all of your chattels! Why stop at monitoring their activity? Monitor also their location! And include a mic to record all of their conversations and other sounds in their environment. Maybe also a camera! And link it to all of their devices, so you can record and monitor everything that's visible on all of the screens in their vicinity. Maybe also pair with their wristband and an AI that can detect the movements associated with masturbation so you can sound a klaxon. Don't even get me started with the potential for "gamifying" it. It's turned out that Fridays have worked out well for meeting up with friends this semester. It used to be Buzz that would bring us together for lunch, at "high noon" for beer and conversation. But since his untimely passing, those who remain try to find ways to keep us in touch. Some have had evening events, but I've invited people to meet at BLDG8, Buzz's favorite brewery. It works out well for me: after class, I head home, get the car, and drive across the bridge. Not everyone is able to come every time, but yesterday I sent a text message in the morning and got four affirmative replies of friends who would join me. I arrived first. Or perhaps almost first. I was getting out of the when a strange bearded figure approached me. It was only belatedly that I realized it was Bug Rodger. (I have two friends named "Roger" that Daniel has dubbed "Rogue-Air" and "Bug Rodger" to distinguish between them). I was shocked and asked if he was trying to pass as a bryologist. Rodger acted as though he had no idea what I was talking about. I assured him that byrologists always had big beards — not long scraggly beards like herpetologists, but full bushy beards. I indicated he had a good start. When I explained this to Tom several minutes later, Tom expressed some skepticism about my insight. I admitted that my inference, tho drawn from long experience, was perhaps dated and that, although byrologists 30 years ago were all big, beefy men with full beards, perhaps nowadays they tended toward slim, stylish men with neatly trimmed beards. And, I said, as Rodger doubled over in laughter, with small close-set eyes. Jules Cardot, 1860-1934. A French Botanist and Bryologist. In the morning, I got him to regain control of his twitter account so he could watch comments on the #boskone hashtag. The author community uses twitter better than most and I find it to be a fun way to keep track of events and connect with people at the conference -- and with the people who couldn't attend. The trip was simple (get on the mass-pike and drive for 1 hour 40 minutes) and we found the cheaper parking without much difficulty ($18 for the day). We arrived with a half-hour to spare before registration opened, so we hung out and inspected the program to pick what we wanted to do. Well, Daniel did that, while I dorked on twitter. The panels showed a thoughtful balance of gender and race. The only unbalanced panel was the panel on Clothing that Creates Character: all seemingly white women. Maybe they couldn't find a man to participate. Or, perhaps, the men who tried to volunteer to participate got stuck with pins until they put their hands down. It was one of the best panels I attended: I learned a lot. Although I felt just a little sorry for Janet Catherine Johnston and J. Kathleen Cheney: Mary Robinette Kowal and Elizabeth Bear could put anyone in the shade. Suford Lewis did an amazing job of moderating: each question brought out interesting stuff and each following question really drew from what hadn't been said yet. It was masterful. Scott Lynch's moderation of Class Structure in SF and Fantasy brought out good contrasting views from the participants. Each brought a different dimension to their responses which made the panel particularly interesting and useful. I was a little surprised that nobody mentioned HG Wells' Morlocks and Eloi. Or Heinlein. It was during this panel that I realized that I was expecting scholarship which is totally unreasonable for a writer's convention staffed by volunteers. I very much enjoyed readings by Scott Lynch, Elizabeth Bear, C.S.E Cooney (who had been recommended to me by a friend on twitter) and Carlos Hernandez (who just happened to be following C.S.E Cooney). Daniel particularly liked the funny voice Scott Lynch used for his tea-kobold. I asked C.S.E Cooney about how her writing flowed so smoothly off the tongue. Her response was about the performance: how she prepares to give a reading by singing the manuscript or reading it various ways. "So it's just about the performance? Not an essential quality of the manuscript?" That set her back for a moment, but then considered how her understanding of performance led her to draft her manuscripts in particular ways. Very insightful. We probably could have stayed for one more session, but we left around 5pm. Daniel was nodding off and didn't want to embarrass himself by actually falling asleep during a session. We headed out into the twilight for the long walk back to the car. And the drive out of the city and into the dark of rural Western Mass. The salt trucks were out covering the roads with rock salt as we arrived back in Amherst and the first flakes began fall as we drove up over Orchard Hill. On Friday, I sent Tom a message via chat to see if he was around and a couple of minutes later he sent me an SMS message. It turned out these events were independent of one another, but we both had the same idea. Tom had gotten a new growler as a present for Christmas and I had gotten a new growler cleaning brush from Phil and so we both had growlers on the mind. We consulted our schedules and agreed to visit a brewery on Saturday to get our growlers filled. And to take a road trip, sample beer, and have good conversation along the way. I suggested we try Brick and Feather Brewery in Turner's Falls. I had gone there with Buzz about a year ago and, although we hadn't really liked the place, I wanted to give them a second chance. It just didn't seem like a welcoming place to me: they have the counter roped off, so you can only approach it to purchase things, and everything is transactional: no samples, no conversation, just buy something. When we arrived, it seemed the same. I approached the counter and expressed interest in getting a flight and then filling a growler, but the woman explained that they only fill amber glass growlers. "That's just our policy," she said. I replied, that being the case, I guessed we wouldn't be buying any then. We did sample their beer. They seem to have some quality control issues: their IPA, In Absentia wasn't as good as it sometimes is. I guess I don't need to go back there again. Oh, well. I tried. 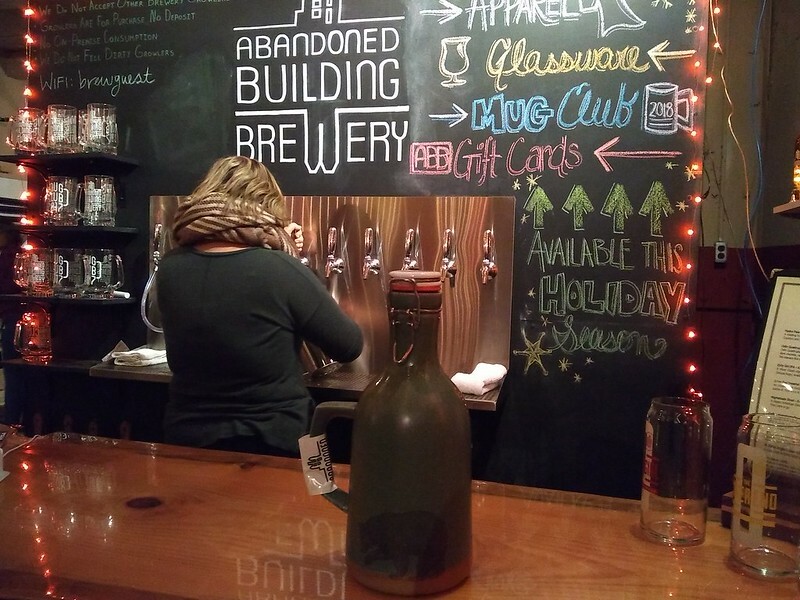 I felt a bit defeated, but Tom suggested we go to Abandoned Building Brewery in Easthampton. It was a bit of a drive, but they seemed happy to see us and complimented me on the beautiful growler I had. She said the only requirement was that it had to show the volume (which both of ours did. In France, the beer glasses all have fill lines with the volume indicated too.) She took our growlers back and put them in the fridge to cool down while we sampled beer. Well, Tom sampled beer. I already knew I wanted The Other End which is a really outstanding Imperial IPA. Tom tried the Hydra and Dirty Girl, but ended up getting a growler of The Other End too. Along the way, we had a lovely time: lovely winter scenery for the drive, pleasant conversation in the car, and fun games at the brewery with the kids. (They watched a movie in the car). Oh! And a growler full of delicious beer. Growing up, my mom frequently made delicious pies for dessert. She was a stay-at-home mom who always fixed a traditional family dinner at night. To please my father, these meals needed to include a fresh, home-made dessert. Cakes, cookies, and one time even Baked Alaska (in response to a challenge). But pies were her speciality. 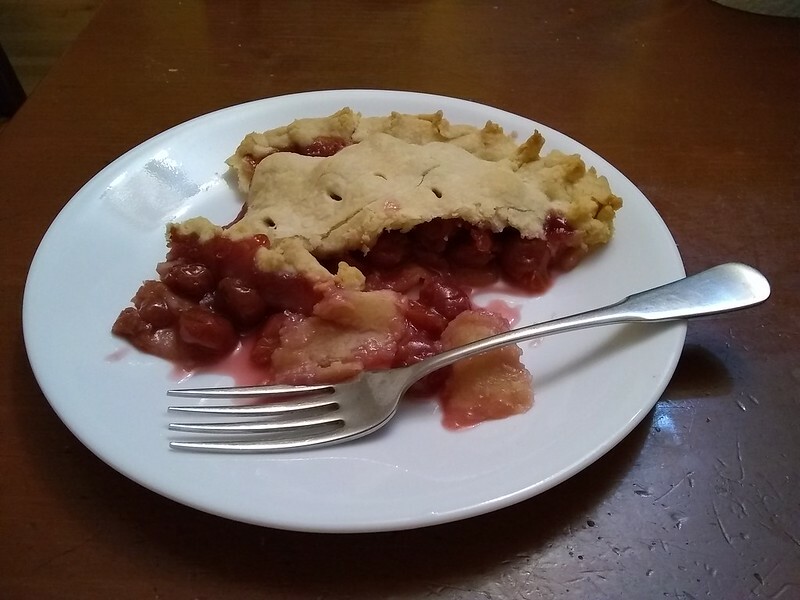 The crust requires mixing a whole stick of butter into flour with a fork, rolling it out into pie crust, adding the fruit filling in the pie tin, then pinching around the edges to seal the filling. Then baking, of course, till it's golden brown. Philip always liked apple pies, but I liked cherry and raspberry pies. A couple of years ago, I had asked mom if she'd make a pie but she said she was done making pies for people. She'd made them the whole time she was married. But now she was retired. It was too much work. No. No pies. She related the same when we were visiting her sister last week. Of course, then I had to tell the story that, when Philip was visiting, I came home to find him eating an apple pie that she'd made for him. He asked for a pie and she ran around to get everything and make it for him. I teased her, just a little, that she'd make a pie for him, but not for me. So she promised to make me a pie too. At the store today, she got the ingredients to make two pies. She related that a neighbor had been talking to her about pie and she had told him she couldn't make them during the summer because it was too hot. But since it was winter now she could make a pie for him too. And she did. I helped her look up his phone number too. (She had said, "Do you think he's in the phonebook?") It turns out it's almost his birthday and he sounded very excited and touched: he said he would be waiting at the front door to receive a pie fresh out of the oven. And I got my piece of pie too. Delicious. Just like I remember from my childhood. This morning was bitter cold. The temperature was below zero when we got up and, when I left for work, was still in the single digits. I took a bus to the stop closest to a door of the building. The wind even for that short distance was brutal. I was hurrying a bit, partly due to the cold, but also because I was almost late for a 10am call. Then I slipped on the ice a few feet from the door. It wasn't a bad fall, all things considered. One foot slid out from under me and I landed heavily on a knee. I dropped the box I was carrying, but I didn't crush it — or my laptop that was in my bag. I breathed for a few moments to take stock of my situation. Then I sat for a few moments to consider how to get back up. I wasn't sure I could get my feet under me without something to push up against. Eventually, I positioned both the box and the laptop so I could balance using them, just until I could get to my feet and I succeeded without obviously damaging either one. Now late for my call, I walked carefully to the door, and found it was locked. The only door I have a key for is way back on the back side of the building. But another door nearby is supposed to be always open, so I made for it first. Also locked. So then, now risking frostbite out in the wind, I limped sadly around to the far side of the building and let myself in, blood staining my pantleg from the skinned knee. But, tho late, I was able to take the call using my laptop, which still worked fine. And I opened the box with the aquarium (a replacement aquarium because the original was damaged in shipment) and it seemed fine too. 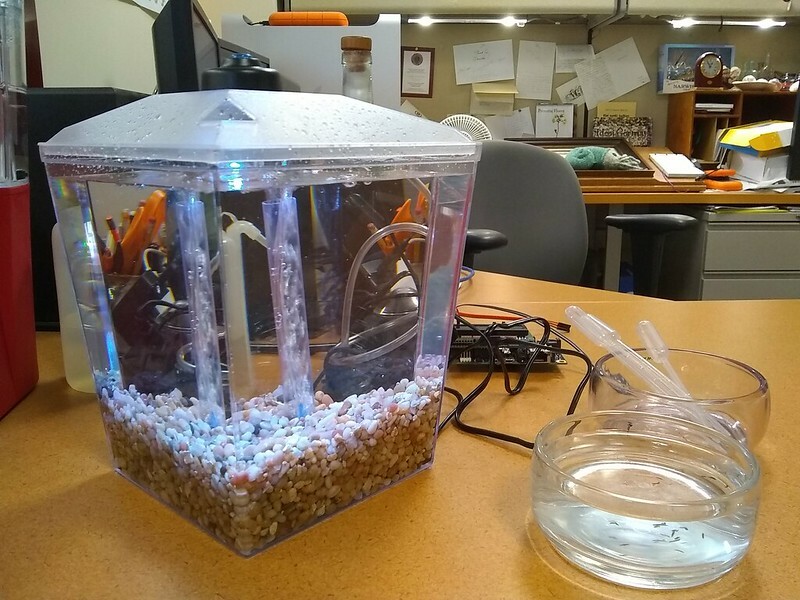 I rinsed it out and set it up so my planarians will have someplace to stay while I'm gone. I put a couple in at first to make sure it's OK. But they just vanished into the gravel. Once I put the rest in, I'm not sure I'll ever see a planarian again: they may only come out at night. That's OK. I'm very happy with the aquarium, though. It's pretty much this one. It's only one gallon, which is plenty for planarians, and has a simple under-gravel filter, which I think will be a good fit for them. It has a light that uses a couple of square LED pixels and can cycle through supposedly 7 different color combinations. It uses AA batteries, although it can use an adapter. And it turns out the adapters I got the Intel Galileos work fine and I have a surfeit of those because they sent me replacements because the first ones didn't meet FCC regulations (emitted too much RF or something I couldn't care less about). David Brooks says the GOP is rotting and he's right. Since the election, we've seen a race to the bottom as the GOP indulges in greater and greater excesses of their abuse of raw power to enrich themselves and punish their enemies—or just anyone they can rob. And traditional limits no longer seem to apply. Each day brings a new series of outrageous statements and behavior that, in the past, nobody would have tolerated. Now there seems to be no limit to what the GOP will tolerate: even embrace. Who knew the evangelicals would accept pedophilia as long as, by doing so, they could pass favorable appointments and legislation. It leads me to wonder what is too far. When Germany invaded Poland, they had constructed a list, the Sonderfahndungsbuch Polen or Special Prosecution Book that had the names of 61,000 people on it: activists, intelligentsia, scholars, actors, former officers, and prominent others who were identified to be rounded up and shot. There isn't anyone named "Brewer" on the list, but there are two named "Breuer". Are such lists being drawn up by Republicans? If there were, would that be too far? It may seem like hyperbole, but when political leaders seem willing to tolerate blatant lies and persistent corruption without blinking an eye, you have to wonder whether there is any limit at all. Read more about What's too far? What kind of human being acts like this? What kind of person doesn't understand flattery enough to recognize (1) that a foreign power was appealing to his narcissistic ego by releasing the US citizens that way and (2) that expecting people to kow-tow, or show fealty, for something that he, personally, had little or nothing to do with is asking people to lie to your face. I suppose that's what power means to Donald Trump: the power to hold people down, rather than to lift them up; the power to divide them, rather than unite them. The Democrats, the left has this 30-year playbook of how to destroy conservatives by simply exposing the horrible, the mean-spirited, insensitive things they say, but that isn't going to work on Trump the way it works on conservatives, for a whole host of reasons. As I said yesterday, the Democrats have some work to do if they want to articulate a vision that isn't just pointing out what a horrible person Donald Trump is, because Americans don't seem to care anymore. They seem motivated more by revenge: looking for enemies to punish for their decline in fortunes. Why they choose to punish the powerless, rather than the ones who actually caused their misery is anyone's guess. 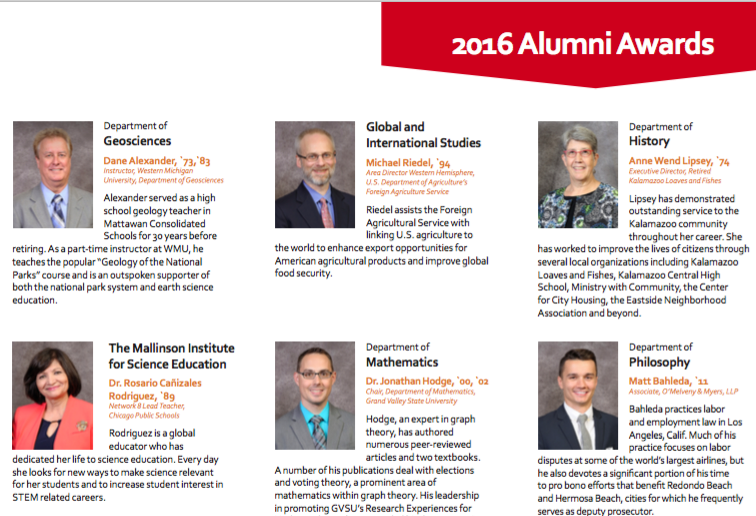 I was very gratified a month about when my alma mater invited me to return to accept an alumni achievement award. I flew to Detroit, rented a car to drive to Kalamazoo. I had a nice reunion with an old friend along the way. The day of the award was a fabulous event. I gave a talk that was well received. There was a luncheon and two receptions. I spent a following day with family and then had brunch with another old friend while returning to the airport. On Friday, I found an envelope in my mailbox at work with a very nice thank you note and a thumbdrive. 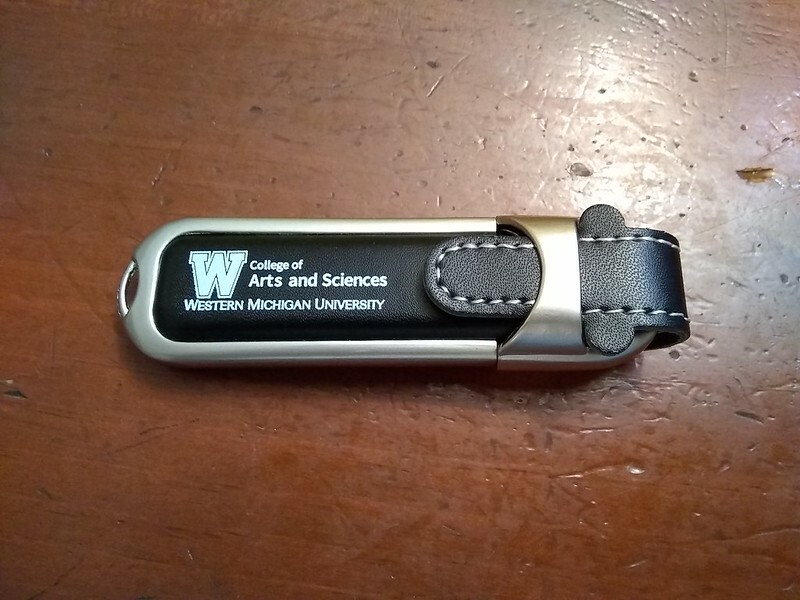 The note said the thumbdrive had pictures. 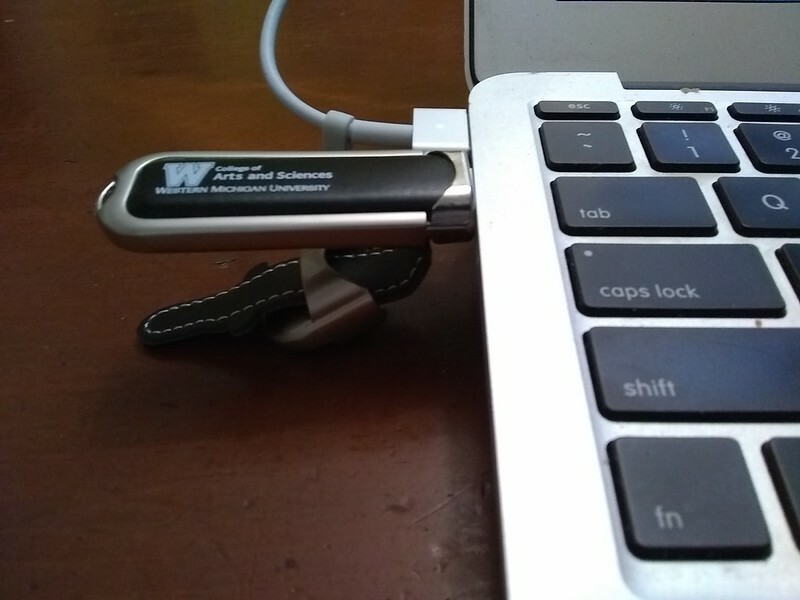 I went to plug in the thumbdrive and found that the design of the drive didn't anticipate people having a thin laptop like a Macbook Air. It has a cover on a leather strap that folds under, but it still requires 4 or 5 mm below the bottom of the laptop that aren't there. The only way to plug it in is to hold the laptop up, so it doesn't damage the port twisting the the thumbdrive up. The 4GB drive contained three items, totaling about 60MB. (In other words, if it was a glass, it would have a eyedropperful in it): an individual photo, a group photo, and a copy of the Arts and Sciences Alumni Magazine. Being completely self-centered, I looked through the issue to see what it said about me. It didn't. It had a listing of last year's award recipients, but didn't mention me at all. Now, maybe that's what their plan was… But somehow I think they just included the wrong issue on the drive. I'm grateful for the thought. And I'm still very grateful to have received the award. But maybe just a URL would be better next time. But, in flyover country, maybe sneaker net is as good as you can do. I'm not one for conspiracy theories, but I have formed one that potentially explains the behavior of the Trump administration. What if their goal is to undermine the ability of the establishment Republicans from fulfilling their campaign promises. By fomenting division and creating a side-show atmosphere, the Republicans have been unable to pass a single piece of significant legislation since the election. Their horrendous "repeal and replace", the "Muslim ban", immigration, it's all gone down to failure. By adding "repeal but not replace" to the tax bill, that might fail also. And Steve Bannon has announced he's planning to run primary races against all the establishment Republican candidates. Several establishment Republicans have already said they aren't going to run. Normally, one might assume that the Democrats would sweep these races. But the Democrats have singularly failed to distinguish themselves with a message that identifies themselves as anything other than the establishment. They didn't cause the housing collapse, but didn't hold the ones who did cause it accountable. The stimulus the Democrats passed prevented a total collapse of the system, but left millions jobless and homeless and without prospects for years. Obamacare was a compromise that insured millions of people, but cobbled together out of the existing pieces, satisfied no-one. Democrats are just a kind of Republican-Lite: a kinder, gentler neoliberalism. Too many Deemocrats believe they can point a finger at Trump and say "We're not him" and that people will vote Democratic. I'm concerned that, instead of voting for Republican Lite, when given a choice for a new Republican, that isn't part of the establishment, many will vote for the new Republican. If Democrats want voters in red states to vote for them, they need to clean house. They need to articulate a vision that explains how to shift power back into the hands of ordinary people.